The Canadian Yachting Association (CYA) Learn to Cruise (LTC) and Learn to Sail (LTS) sailing programs are ranked among the best and most respected training programs in the yachting world. These programs have been the benchmark for teaching sailing and navigation in Canada for decades and are utilized by sailing schools and yacht clubs across the country. The LTC program teaches students both sailing and navigation skills and is therefore recognized throughout the charter industry. As the CYA is the official governing body for yacht racing in Canada (including all Olympic classes and offshore racing events) it is therefore involved with nearly every yacht club in the country. The CYA LTC training syllabus for cruising yachts is structured to be taught in 7 program levels (basic cruising, intermediate cruising, coastal navigation, advanced cruising, advanced navigation, celestial navigation and offshore cruising). This training format is very similar to the RYA program taught throughout the UK and the US Sailing and ASA programs taught in the USA. S/Y Ramos Fizz is set up to conduct course primarily at the Advanced and Offshore Cruising levels however our instructors are qualified to certify students at all levels of the CYA cruising program. As many experienced coastal skippers have acquired their sailing skills and experience outside of the CYA program, we can structure programs to refine those skills already mastered in order to successfully challenge and receive CYA accreditation. 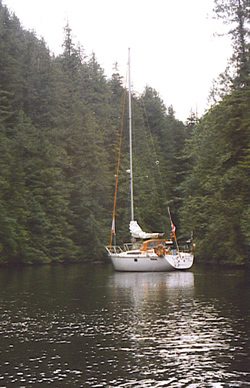 Sailing the west coast of Vancouver Island is considered by many to be one of the most challenging and pristine coastlines in the world. As such many of our students have continued on to make their own offshore passages to explore distant shores on the oceans of the world.